To provide a technical insight into Oracle AP/AR Netting with hopes of giving the reader a good understanding of the different setups involved. Even though this paper is written to cover the technical aspects of Netting, it will also provide a functional insight of this functionality. This paper is written with the intention of helping implementers and those supporting the application to under how Netting works. 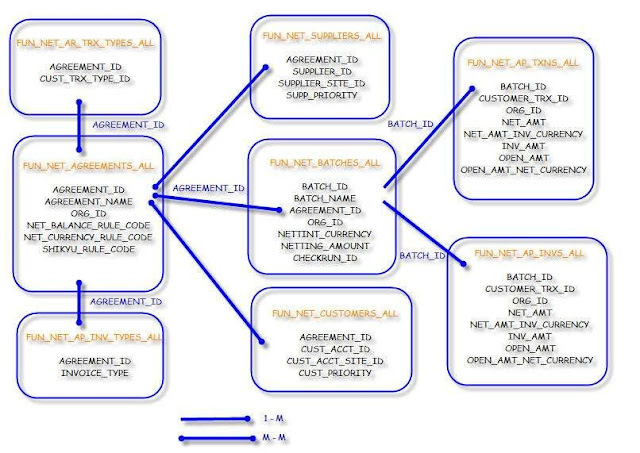 The Oracle AP/AR Netting is a feature that provides a foundation to create netting agreements with flexible definition of business rules and association of trading partners. It executes an automated netting process so that customers can reduce their debt obligations without incurring bank charges by creating unnecessary payments and receipts. Oracle AP/AR Netting allows you to net your Payables invoice balances against your Receivables invoice balances for those Customers who are also your Suppliers. For example, If you have a customer who is also your supplier, then rather than him paying you and then you paying him, AP/AR netting allows you to pay the net difference between how much you owe the supplier and how much he owes you. After establishing a netting agreement with such trading partners, you set up the agreement and the rules associated with it in eBusiness Suite and you can then start to net AP and AR transactions. Below is a conceptual diagram of how this works. How it worked before R12? This Globalization feature was originally a solution for Germany in Release 11, but then it became a Regional Globalization feature in Release 11i. This solution specifically addresses the needs of US requirements. In Release 12, AP/AP Netting has become "core" functionality and is the only netting solution available, which means Contra-Charging and US Federal Financials Netting are all replaced by this solution. Each of those features has a migration path to the Release 12 Netting feature. How does it work in R12? 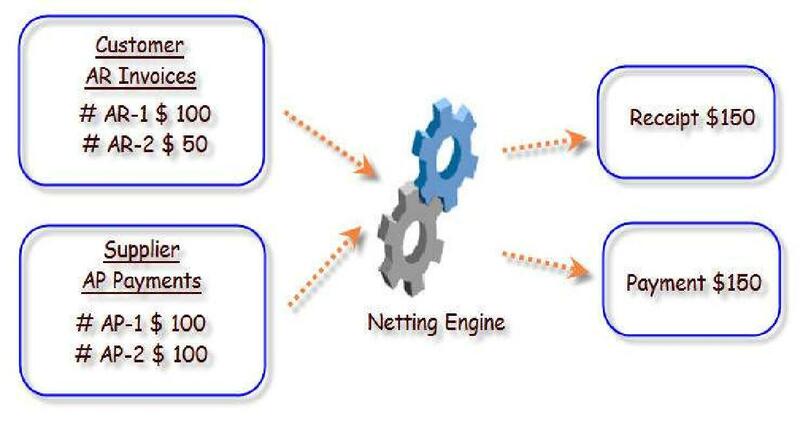 Here is the conceptual diagram behind the Netting Engine. We will be discussing in depth as you scroll down. I also recommend that you walk through the additional simulation sheet, which is attached to this white paper. What are the Setup Steps involved? Check the “Allow payment of unrelated transactions” checkbox under the Receivables system options, if you want to create netting agreements across multiple unrelated customers. If approval is required for a netting agreement, the approver must be set up as a contact for the trading partner (Customer / Supplier). The contact must be setup with an email address. Yes – This will select invoices that were matched to purchase orders with outsourced assemblies by the netting process. No – This will select invoices that were matched to purchase orders without outsourced assemblies by the netting process. D (disregard) – This means all eligible invoices will be selected for netting irrespective of whether or not they are matched to purchase orders. Create netting agreement to setup the rules that will decide which transactions are selected for netting and how they are ordered and processed once selected. Note: -The complete setup steps, including screenshots can be found in the attached simulation sheet. How Netting batches are created? Let’s have a look at how Netting batches are created. The following diagram will depict how invoices are ordered and selected for creating a netting batch. 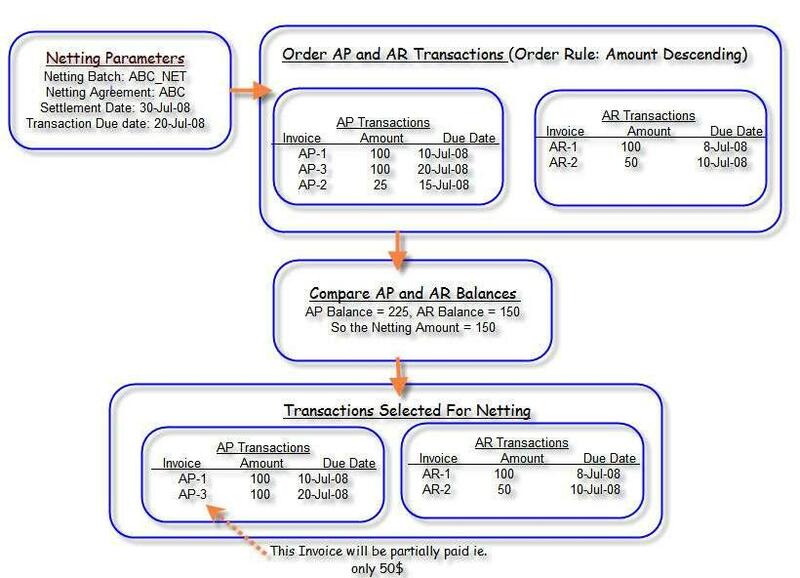 In the following sections, we will discuss what criteria are used for selecting AP Invoices and AR Transactions, and how they are ordered for netting. Transaction due date must be less than or equal to AP scheduled payment due date. AP scheduled payment due date must be between the Netting Agreement Start Date and End Date. Only invoices for the Supplier and supplier sites (if specified) in the agreement are selected. Only invoices with the selected invoice types in the agreement are included. Operating unit of the invoices must be the same as the operating unit of the batch. Invoices that have already been included in a batch that is not yet in status ‘Complete’ are not included. AR Payment Schedule due date must be less than or equal to transaction date mentioned in Netting. AR payment schedule date should be between the Agreement Start Date and end date. Only Transactions for customer and customer sites (if specified) in the agreement are selected. Only transactions with the selected transaction types in the agreement are included. Operating unit of the transactions must be the same as the operating unit of the batch. Transactions that have already been included in a batch that is not yet in status complete will not be included in the new batch. Invoices and transactions are first ordered by Supplier and Customer priority associated in the agreement. They are then ordered by Netting order rule selected in the agreement. The priority is important as this determines which transaction/invoice will be netted first. What happens when we submit a Netting Batch? The following validations are performed when a netting batch is submitted, as there might be a time lag between when the batch is created and when the batch is submitted. It is also possible that the batch may have been modified. If the current date has passed the batch settlement date, then the batch is set to status ‘SUSPENDED’ and the AP invoices are unlocked. AP and AR balances for transactions are validated again. If the validation fails then the batch is set to status ‘ERROR’ and the AP invoices are unlocked. How Netting Batches are settled? o If any validations fail, the batch is set to Cancelled Status. o Validations are also performed to check whether the GL, AR, and AP periods are open for the batch settlement date. If not, then the batch is set to status ‘ERROR’ and an error message is displayed in the Report log. 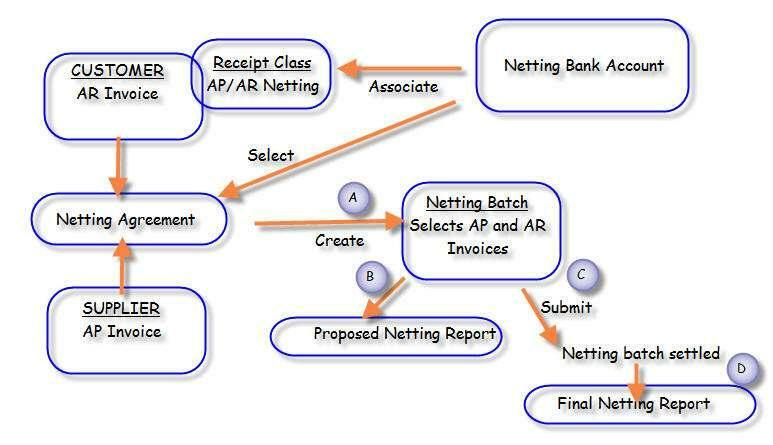 o Netting bank details like bank account name, bank account owner and number are derived based on the FUN_AGREEMENTS.bank_account_id for the given batch. o Invoices in each batch are grouped by vendor, vendor site and invoice currency code. If all processing goes through successfully then the batch is set to COMPLETE and the AP invoices and netting agreements are unlocked. What are various Netting Batch Statuses? AP/AR Netting engine is owned by ‘Oracle Financials Common Modules’ (FUN) Product. All tables behind the scene will be stored under the FUN schema. How these tables are linked? Here is the Entity Relationship Diagram (ERD) for AP/AR Netting.. The Oracle AP/AR Netting feature provides a foundation to create netting agreements with flexible definition of business rules and association of trading partners. It executes an automated netting process so that customers can reduce their debt obligations without incurring bank charges by creating unnecessary payments and receipts.